This entry was posted on Monday, April 16th, 2018 at 6:38 pm	and is filed under A Little Sunshine, DDoS-for-Hire, Tax Refund Fraud. You can follow any comments to this entry through the RSS 2.0 feed. Both comments and pings are currently closed. 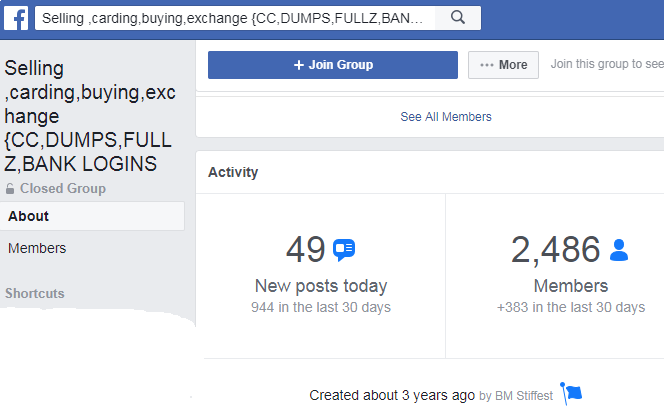 In the course of researching a massive fraud wave at my employer over the fall and winter, I found a ton of scammers in Facebook groups like these openly advertising expertise in getting fraudulent accounts open at my institution specifically. Without thinking, I conducted this research using my own personal account, and ever since, all of my suggested groups have been Nigerian and Ghanian 419 scam groups and other bank fraud related groups. Quite a few of them were even fully open to the public! I guess these guys will now find another rock to go under. For this sort of thing, I imagine a clued-in judge should give permission, then the groups should be watched and the participants progressively neutralised. With this approach I imagine many will escape, to scam again. These pages are legit – they run a business, they want visibility and they want traffic. Facebook is easy to find and easy to use. They don’t care that their activities are tracked by FB and various governments, because their own governments are complicit or turn a blind eye. Russia’s largest carding website (Can’t recall the name) doesn’t even bother to host a .onion website half the time, since they don’t care. They want people to find them easily so they can sell stuff. it’s feshop if I’m not wrong. I don’t recall them hosting under an onion domain or have a mirror onion domain. Actual number of individual members in those groups was not even close to that number. Typical FB behaviour is that when you a member of one type of group you are a member in many of those groups. Also FB groups which are not location limited tend to have a lot of fake profiles just spamming something. I find it amazing that fb actually nuked groups. Every time I’ve found an illegal one and reported it, they told me it didn’t violate their tos. Dear me – Do you have screenshots of that? You might want to share their refusal to take down cybercrime groups. But Brian Krebs has respect and a wide audience – so facebook acted to minimize the damage to their reputation. They were getting flak for allegedly taking down “conservative” pages – imagine the furor if they refused to take down cyber-criminal pages. This goes back at least 5 years. I finally decided that when I found a group formed doing something illegal, I end up reporting them to the FBI, IC3, or NCMEC, depending on which it falls under. I figure that since FB won’t do anything, maybe LE will. who do still carding in these days? cvv dumps,and bank transfers drops is old old old. old carders have moved to new fields new moves new ways. carding was good maybe 20 years ago but now not anymore! even in carding forums good admins admitted that carding is over. Is this meant to be a poem? Rhyme of the Ancient Hacker? FB mentions automation as a solution like it’s some newfangled thing they must look into. They surely have the tools to flag cybercrime patterns like these, they just haven’t dedicated resources to it. Lack of priorities and/or ethics, until called on the carpet. For groups to last 2-4 years without prior complaints/reports is suspect. They just couldn’t ignore one from Krebs in this case. Well done! I have reported groups through the years and those reports went absolutely nowhere. FB’s reporting tool is a bad joke at best. The company & its platform is a total disgrace. Apparently, even after this article was written, Facebook still is clueless on how to handle these groups. This just makes you question what exactly Facebook monitors do with their time, if some of these groups had existed for over nine years – clearly they would still be up if it weren’t for krebsonsecurity. It also begs the question of how seriously Facebook takes it’s own terms of service considering these groups blatantly violated the terms and yet still got away with it. FB goes after conservatives, that’s what they do in monitoring. Why not google it? Its actually an easy process, its just getting started is the hardest. I’ve done it a couple of times over the years, and I admit, FB doesn’t make it apparent for seeing it. Deletion of the account has to be “requested”, otherwise it only gets deactivated (or, something). Even when it is “deleted”, quite possibly only the login is disabled and the data will stay on there (forever? ); just, won’t be accessible to the public /users. And, instead of fixing all of the broken systems which they expose (more of which there will be tomorrow), they get… What, arrested? For what, exactly? You put a gold bar into the middle of the street and nobody is supposed to pick it up? Yeah, ok.